The death of the great mime Marcel Marceau marks a sad moment not only to the theatre and arts world but is also a great loss of a WW II hero. The Nazis uprooted the Jewish residents of Alsace-Lorraine after marching into the region in 1939. Marceau and his family were given two hours to pack their belongings, as they were to be transported to the southwest of France. Instead, the brothers changed their name from Mengel to Marceau and fled to join the underground movement in Limoges, France. Marceau’s father, a kosher butcher, was captured and deported to Auschwitz in 1944, where he was killed. While in the French underground, Marceau used his artistic skill to change the identity cards of scores of children so they would appear to be too young to be sent to labor camps. He also posed as a Boy Scout leader, and under the pretense of hiking in the Alps, he led children to safety in neutral Switzerland. After Paris was liberated, Marceau enlisted in the Free French Army, where he was appointed liaison officer to Gen. George S. Patton because of his fluency in English. Word of Marceau’s pantomime antics spread through the troops, and soon Marceau gave his first performance to Americans in an Army tent before 3,000 GIs. ”We shall never, never destroy evil, unfortunately, but good exists also and has to reach maturity.”, he used to say. On 5 April 2005 the International Raoul Wallenberg Foundation distinguished world’s greatest mime in recognition of his solidarity and courage during the Second World War. 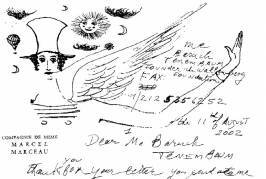 On August 2002 Marceau wrote a letter to Baruch Tenembaum, IRWF founder. The letter was handwritten and accompanied by a drawing of the mime, the same that illustrates this article.